A composite image of stars taken during an earthquake in Chile. Photographing the sky with a high-powered telescope during an earthquake can leave the stars in your pictures looking less than stellar. Instead of looking like twinkling dots or streaks of light, they’ll bear a strong resemblance to readouts from an earthquake-measuring instrument. That’s what researchers at the La Silla Observatory in Chile discovered when they looked at images taken by one of their telescopes during a strong earthquake that hit near the coast about 55 miles away from the observatory. The earthquake struck on January 20th, just as the robotic TAROT telescope was tracking satellites in orbit. 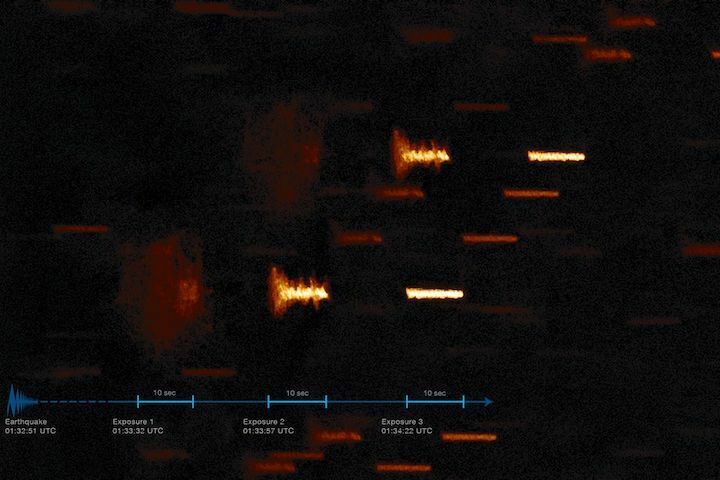 As the ground shook, the telescope kept operating, taking three pictures of geostationary satellites, each with a 10-second exposure. If the ground were steady that night, the stars in the background of those pictures would have looked like short lines streaking across the images. That’s because the Earth is constantly rotating, and while a geostationary satellite keeps pace with our planet’s rotation, stars do not, as the European Southern Observatory (ESO) explains in a post about the pictures. Instead, the movement of Earth (and the telescope on it) during those 10 seconds makes the stars appear as small trails. And that’s where the earthquake came in. Since the ground was shaking during those 10-second bursts, the telescope was shaking, too, making the trails leap. The result looks remarkably like a seismogram, the jagged readout from instruments called seismographs that measure ground-shaking. Put together, the three snapshots show the trembling trailing off as the quake ended. In the composite image, the pictures on the left have larger peaks, showing more intense shaking as the quake hit the telescope, while the smaller peaks toward the right indicate weaker shaking as the quake diminished. This isn’t the first time an earthquake has struck a telescope, especially in Chile, which gets a lot of shaking every year. But it is a pretty cool souvenir of a rare moment when an operating telescope, the Earth’s rotation, and the stars all align.